Polychrome wares embellished with gilt to resemble the appearance of rich brocade is known by its Japanese term, kinrande. Their combination of brilliant colours was derived from highly attuned visual enjoyment of painting, lacquer and silk. In the 16th century, items of this type were exported to Japan where they were highly valued, as the Japanese kilns did not start making porcelain until the early 17th century. Two similar double-gourd kinrande vases, one on iron-red and the other on green, are in the Fukuyama Kinnenkan, illustrated by Yajima Ritsuko, Overglaze Enamel Ware in the Ming Dynasty, Japan, 1996, pl. 77; while a much larger hexagonal double-gourd vase (44.7 cm.) is in the British Museum, illustrated by J. Harrison-Hall, Ming Ceramics in the British Museum, London, 2000, pl. 9:70. 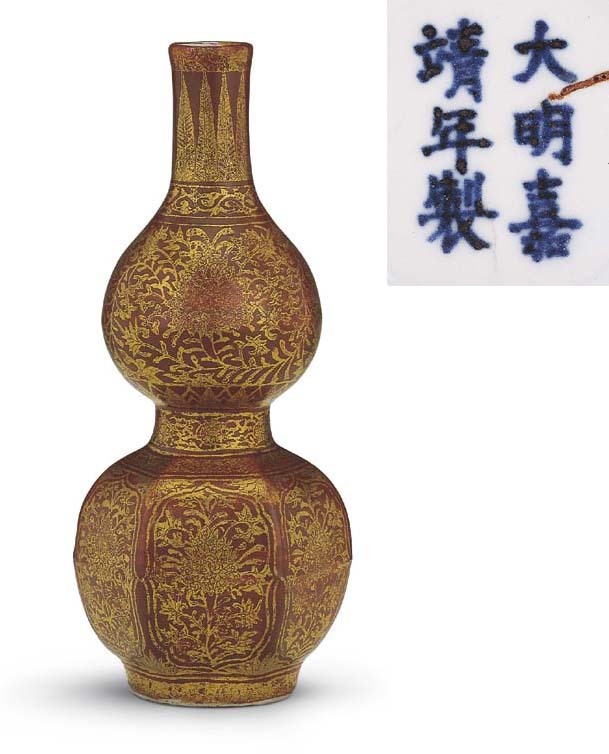 Please note that this vase is Jiajing mark and period but the enamel and gilt decoration are probably later. The revised estimate is HK$ 120,000 - 180,000.